Dr Johnson was one of the first doctors to use Metvix PDT in 2004 to treat skin cancer. The great advantages of using PDT are that it leaves no scarring and it also treats the area surrounding the disease, working effectively and predictably on Sunspots, Bowen’s Disease and Thin BCCs. While PDT is an effective and non invasive treatment of skin cancer, Dr Johnson is careful to select those cases that are suitable for PDT, assessing whether it is the best treatment for the type of skin lesion or sun damage on a case by case basis. His years of experience in skin cancer diagnosis and his extensive experience in this unique treatment method makes him the person of choice when seeking advice about PDT. PDT is a cream and light treatment. The cream is applied to the damaged area and absorbed by all skin cells. Normal healthy cells excrete it immediately whereas cells damaged by the sun, precancerous cells, and early thin skin cancers will retain the cream. When exposed to visible light at certain frequencies, the cream releases an unstable form of oxygen which kills the cells containing the cream, leaving healthy cells unharmed. These healthy cells multiply, filling the void left by the dead cells. The body’s normal repair process kicks in, resulting in healthy and improved looking skin that has not been scarred in the process. Our Sunspot Removal Treatment is safe, effective, leaves no scars and is eligible for health insurance rebates. Our patients tell us that their skin feels younger as well as looks clearer after treatment. The classic method of PDT involves high energy red light. It is still necessary for some more advanced diseases and is often painful. 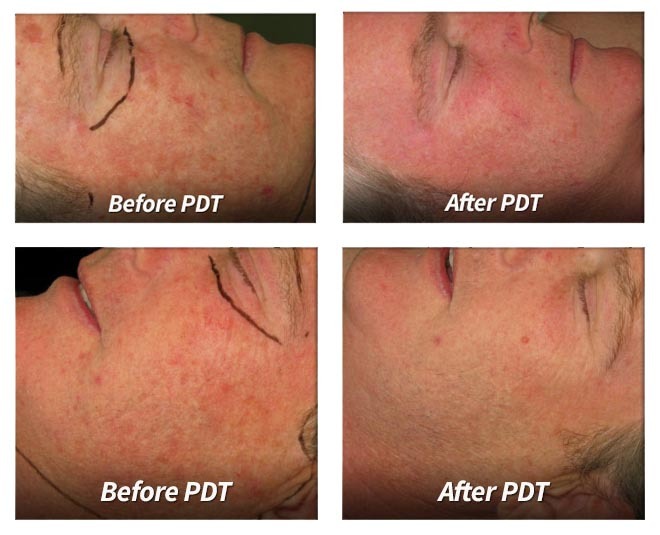 Classic PDT has been available since 2003 and is used for severe sun spots (actinic keratoses, solar keratoses) where there is a pre-treatment of thick keratosis, a shave biopsy if required, and one or two treatments of Classic PDT with Metvix Original. Side effects include pain which can be managed with pain relief and refrigerated air as well as moderate redness and swelling lasting just over a week. Daylight PDT is a newer method of PDT. This is an approved form of medical PDT treatment that involves using a cream and activating it with sunlight. This method is usually painless, with significantly less side effects and a shorter recovery time than classic PDT. It is more cost effective, making it more suited to treating large areas such as the whole face, hands and chest. Being an approved medical treatment some private health funds will contribute towards the cost provided that a TGA listed product is used (ALA is not rebated by the health funds). Daylight PDT is generally used to treat sun spots (actinic keratoses, solar keratoses), involving a single treatment with Metvix Daylight. It is also used for moderate level sun spots (actinic keratosis, solar keratosis) where there is a pre-treatment to firstly remove any thickness of a keratosis by shaving, which will be sent to pathology to confirm diagnosis if required, followed by one or two treatments of Daylight PDT using Metvix. The side effects of Daylight PDT include mild pain and some rednessand peeling lasting up to 14 days.